I cannot help but mention that this is Earth Day, which reminds me that from the beginning God made us stewards of his garden and all of creation. And I come from Nebraska, the home of Arbor Day, which we set aside to recognize the importance of planting trees. 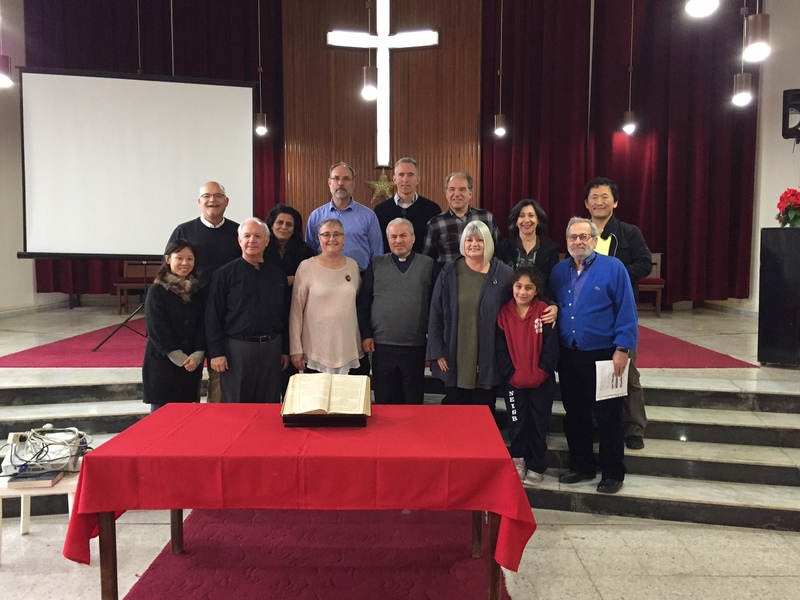 These things struck me as we began our day at the National Presbyterian Church of Aleppo with the planting of an olive tree, but I will return to that later. Rev. 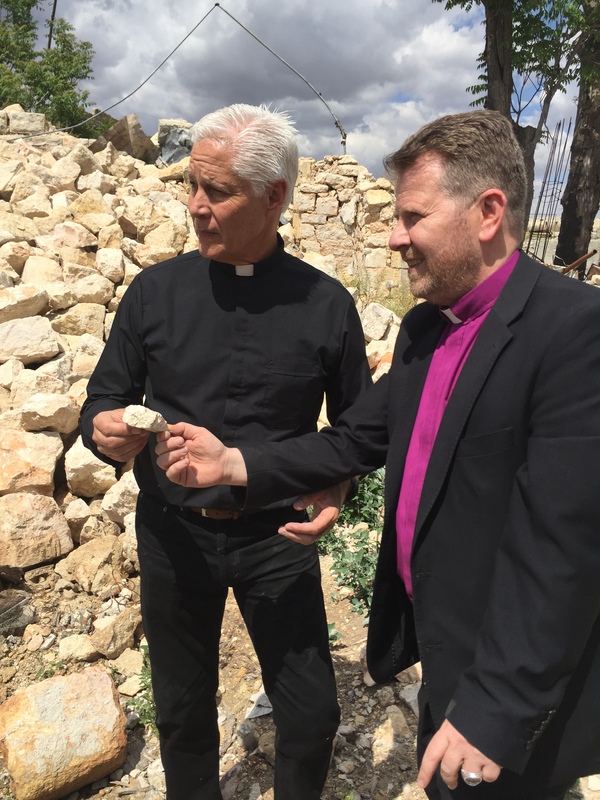 Jim Wood of First Presbyterian Church, Norfolk, Virginia, receives a stone from the demolished Presbyterian church in Aleppo from Rev. Ibrahim Nseir. As we gathered with our brothers and sisters for Sunday worship, I couldn’t help but think back to a hot August Sunday in 2010, the last time a group from The Outreach Foundation experienced the Lord’s day in this place with these people. It was in a building, which dated to sometime in the mid-19th century. That building was destroyed in November, 2012. We stood in the midst of the rubble of that place today with Rev. Ibrahim Nseir and some of the church’s elders. “Where was the sanctuary, Assis?” we asked. As he stood on the broken stones of the place where he once preached and served the Iraqi refugees who were in his city, he pointed over his shoulder to show us. Broken bits of crystal chandeliers and terrazzo flooring were scattered about with pages of burned books and Sunday school papers with the story of Noah. 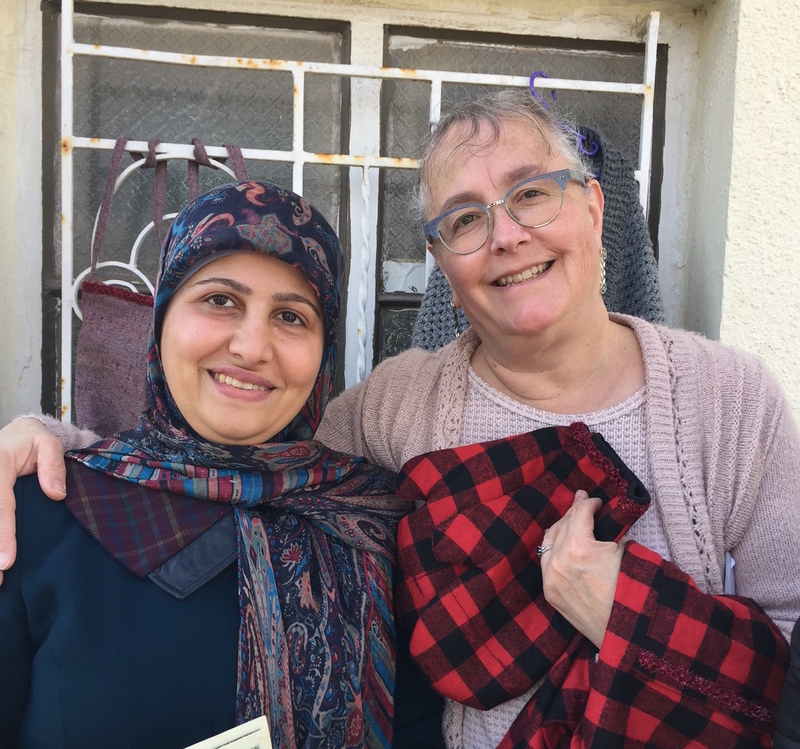 All of this was hard to see for two of us who had been there before the war, and I could hardly imagine how it was for those who then called it their church home. Rev. Tom Boone of Bethel Presbyterian Church in Cornelius, North Carolina, preaches while Rev. Nuhad Tomeh, of The Outreach Foundation, translates. But destruction was not the message we received in their new building today, a building which opened for worship on Christmas day, 2015. Today Rev. 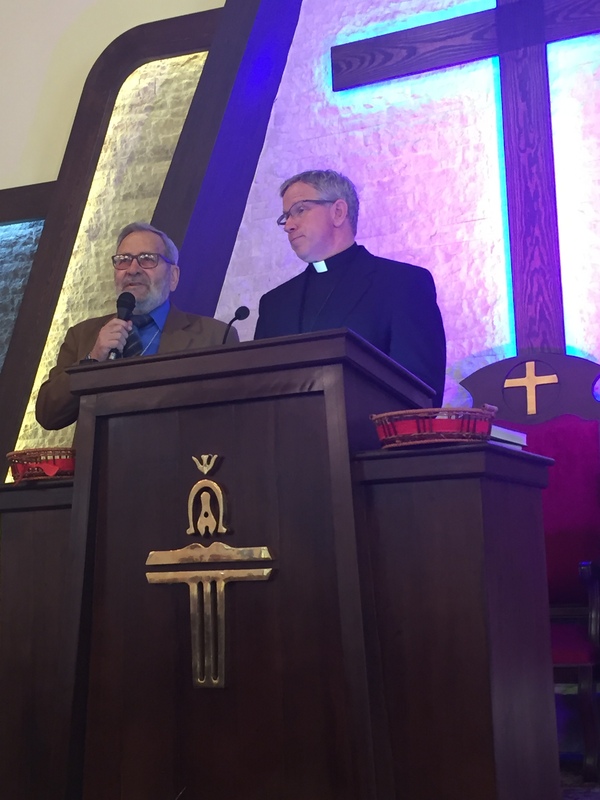 Tom Boone told us the story of a Syrian name Ananias, a story we know from Acts 9, where Saul the persecutor has his eyes opened by Ananias, the persecuted. 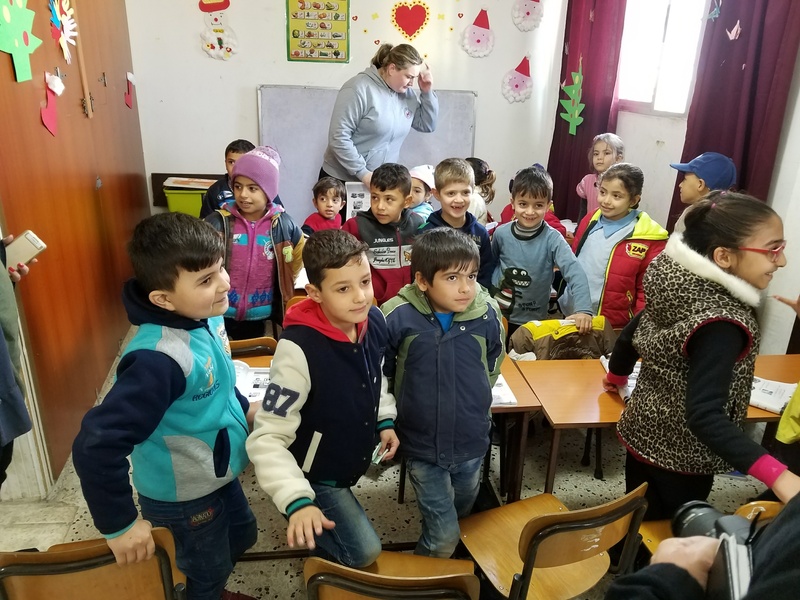 Tom wanted us to grasp what Ananias knew and what the church in Syria knows as well as they serve in this place: If we are in Christ, we are called not to be safe, but to be obedient. God hears our, “Why should I? He wants to kill me,” and answers not with punishment, but with grace because he understands our fear…and yet still he sends us. Just as for Ananias, so for the people of Aleppo church: In courage they stay and serve, because it is not fear that defines them, but hope. There are many things I could write about in a day that began at 10:00 a.m. and ended at 11:00 p.m. Indeed, it is very late when I write this. 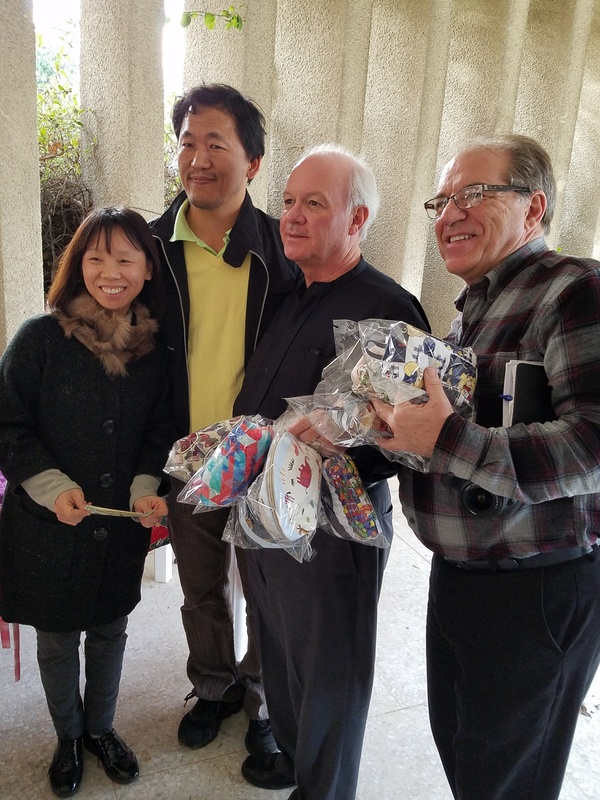 I could write of meeting with the leaders of the church ministries and hearing their challenges and dreams. I could write of the challenges facing the elders of the church as they deal with needs that would send most of us back to our beds with the covers pulled over our heads. I could write of imams cleaning up and reconstructing the Great Mosque destroyed just a few blocks from the rubble of the Presbyterian church. I could write about the amazing hospitality we experienced in this place and the food we consumed. And if my fingers and brain had the energy, I would do so. An olive tree newly planted in hope. 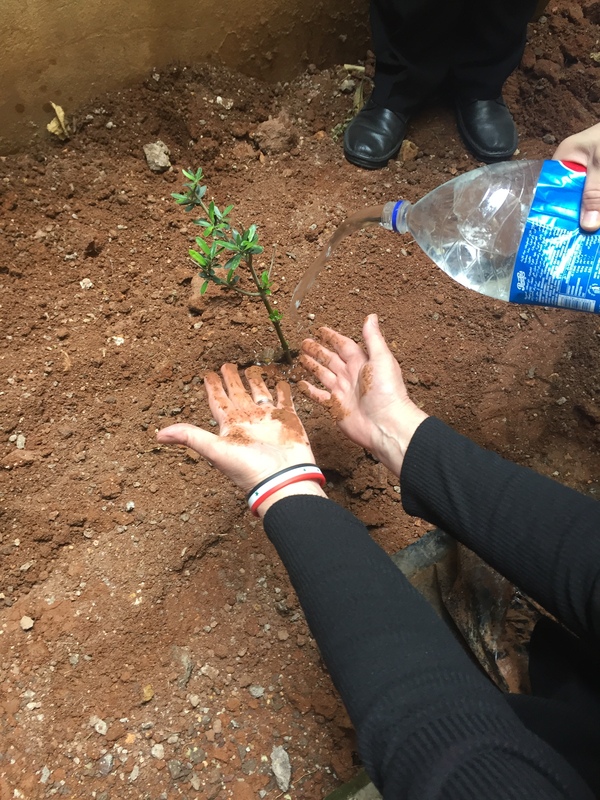 But instead, I will write about hope, for we are a people of hope, and the planting of an olive tree, for that is what we did as the family of God today in Aleppo. In a small yard next to the church building we put our hands on the muddy red root ball of a very young olive tree. After Rev. Ibrahim poured water into the hole prepared to receive it, we lifted the young tree into the hole and pushed the dirt around it. Who would plant a tree in a place where destruction is all around? Who would go to their persecutor and open his eyes? The people of God, called out of their fears into hope, into life. This small tree is the church of Aleppo, and it has, it does and it will bear fruit, fragile as it seems, and will be a part of the healing of this nation.